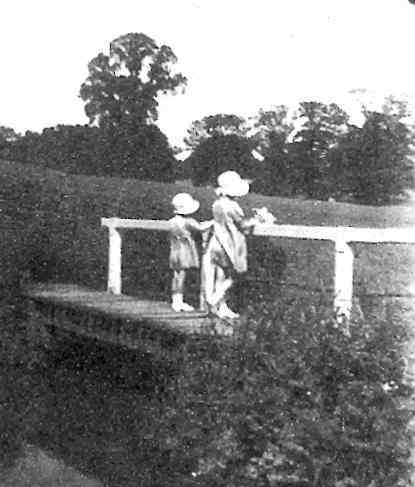 This article was based on a a suggestion by Pam Slade of Canterbury, who spent her early years at Brook Cottage in Hughes Green. 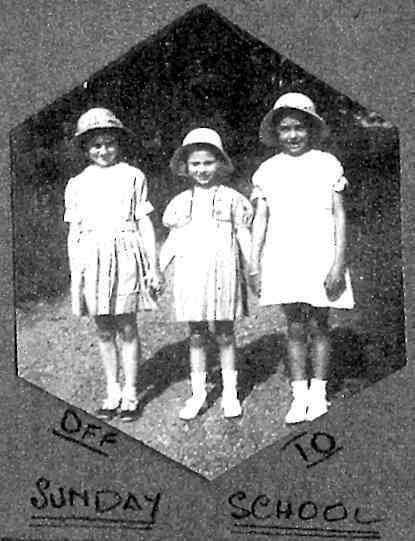 As a child, Pam was known as 'Ann'. 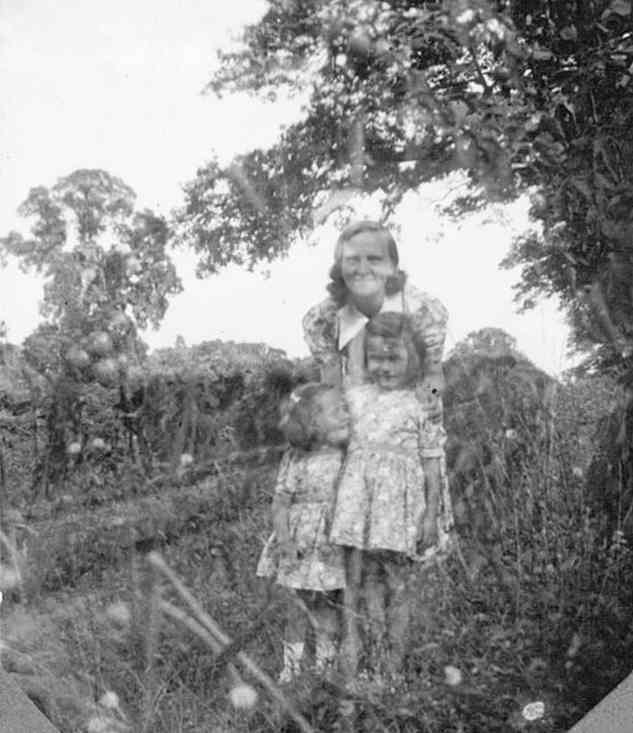 We are very grateful to Pam and her sister for their memories and for the family's photographs. My wartime was a peaceful time. In all of our lives, there was always one important event to look forward to. 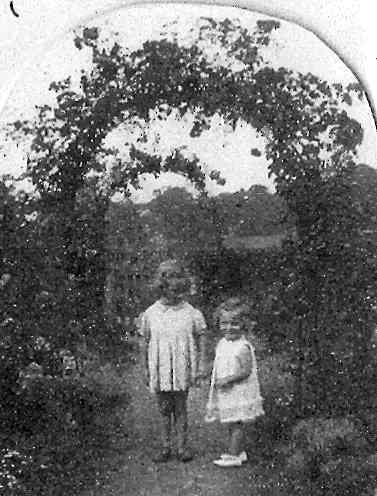 It eventually came just before Christmas in 1944 when the Daddy who had sailed away on a troop-ship to the Middle East when I was not quite two-years-old, came striding down t he garden path just a few weeks before my seventh birthday. Imagine not seeing your Daddy for five years! This handsome soldier, this stranger, was the Daddy I had been writing to; who Mum had talked about and promised would come home one day; who sent photographs of the desert and of Bethlehem and Jerusalem and of all those places mentioned in the Bible stories. Now let's return to wartime. 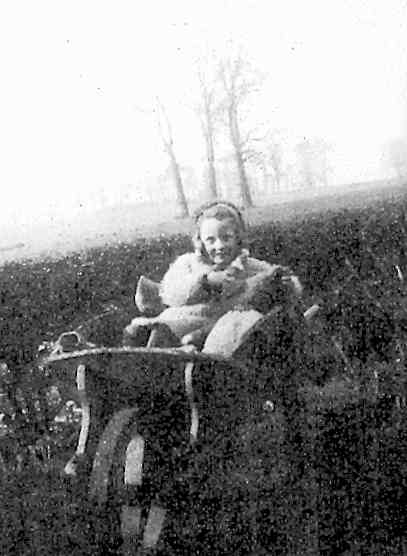 I have a faded memory of sitting in the pushchair on our way to see my Grandma and Granddad Fleming in Winnersh and a terrifying noise seemed to enclose me. As the pushchair was facing the way we were going, the noise was coming from behind – from Arborfield - I suppose. The deep, deep rumble kept on coming, louder and louder, filling my little world with silent fear. Mum pulled in closer to the side of the road, and waited. Lorries bigger than I could ever have imagined overtook us. There may well have been a tank, too. I learnt a new word that day, as Mum explained that a ‘convoy’ was what we’d seen and heard. It’s a word that has never lost its association, with that early experience. My parents Joyce and Percy Slade had moved to our house in 1938. 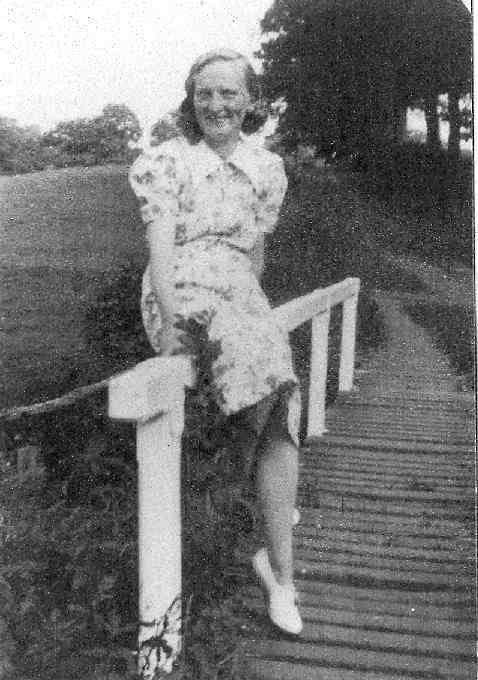 Mum's parents Ada (Ann) and Thomas Fleming lived at Winnersh, and later at Wokingham, when Granddad Fleming took over the Lion Brewery Stores. 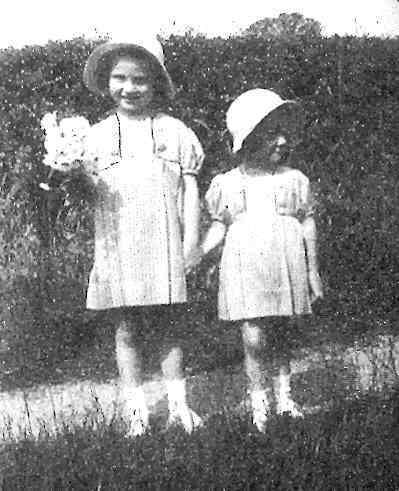 Mum was born in 1911, and her sister Elsie, ten years younger, had a grammar school education and started an office job in Reading at the beginning of the war. 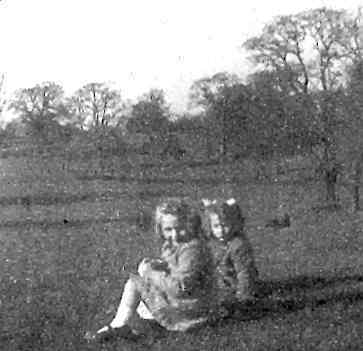 Because Arborfield was in easy reach of Reading, Elsie lived with us at Brook Cottage. At some point she met a “bookish little Scots chap” at a dance, and he would be brought to Brook Cottage for tea sometimes. He was Scottish through and through, not local at all. Born in Fraserbrough in 1915, with an M.A. from Aberdeen university, he was great fun, marvellous with children, and played the piano – concertos and boogey alike with a wonderful technique and no music in front of him! (he was LRAM at 15yrs). A great human being. 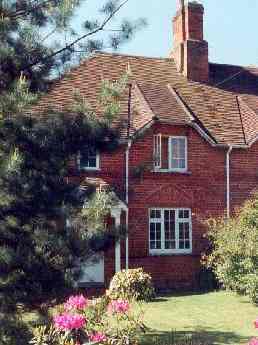 "Brook Cottage" was our semi-detached, tied-cottage home on the estate of the Simonds family of Newlands. Mrs Scott - a dear, kind white-haired lady – lived next door. (The addresses were probably really Nos. 1 & 2 Brook Cottages). 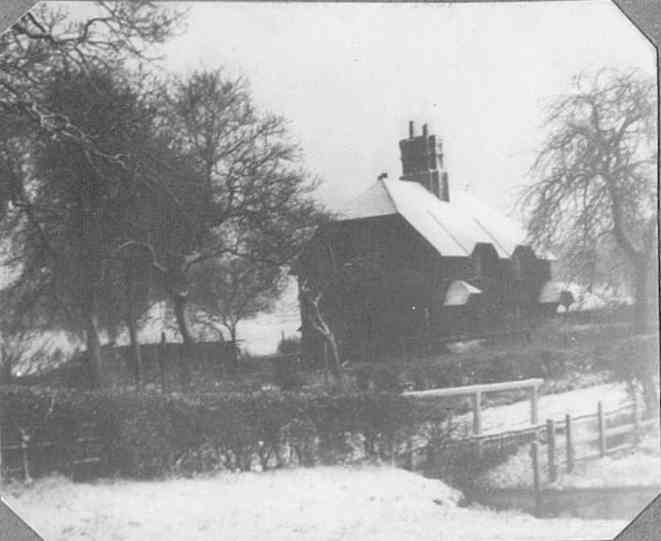 Another old lady, Mrs. Nunn, lived in the thatched cottage nearby. A shallow brook ran just beyond the bottom of the garden, and here we would spend lazy summer days paddling, splashing and squelching in the soft, treacly mud of the riverbed. You had to cross a narrow wooden bridge to be able to continue up our lane to the "big house". We had a good-sized garden with a Conference pear-tree, one or two apple-trees, gooseberries, currants, raspberries, flowers and vegetables. Mum grew potatoes, carrots, shallots, runner beans, tomatoes and even, one year, corn-cobs and probably other vegetables, too. We were certainly pretty self-sufficient in this "Dig for Victory" period. At the end of the garden lived a reliable brown hen. She scratched around and laid us a daily egg in her coop, which meant boiled eggs for breakfast once a week, and a couple with which Mum would bake a batter (Yorkshire) pudding or a cake. Then there was the jam making, bottling and salting-down runner beans. Carol and I each had a little patch of garden where we hoed and raked and planted seeds. We could earn ourselves a penny a bucket for picking up stones when Mum was digging. This is where I must have learnt the satisfaction of financial reward, so I was good at filling the bucket! Carol would lose interest. 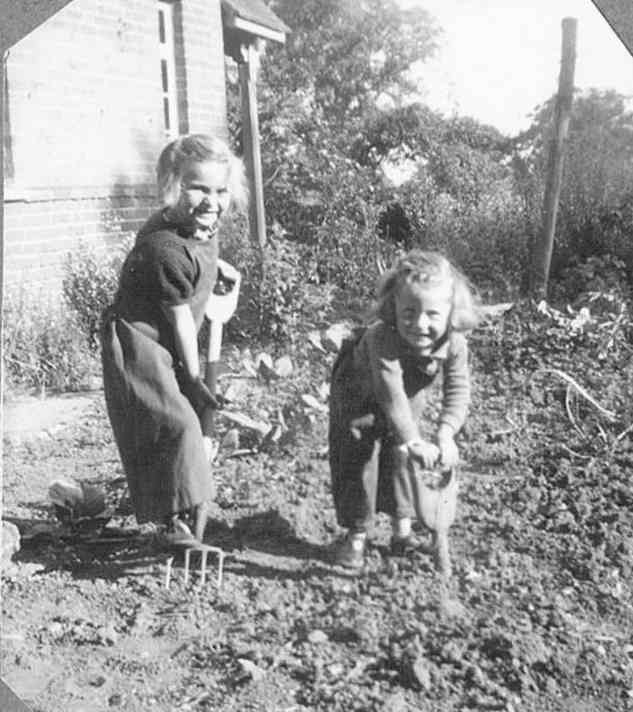 More fun, was to squash under my foot any slugs and snails that came Mum's way when she was digging or weeding. Carol would shudder "Uggh!! ", but this would only spur me on to seek out more victims! "The Coombes" was a woodland of tall silver birches, beech and oak that led off from the track behind our cotta ge. Mrs Scott would take us for walks through The Coombes, and teach us the names of the wild flowers. In spring the woodland would be carpeted with primroses and violets; later with bluebells, wood anemones and shirt-buttons, and in summer, foxgloves stood erect drooping their freckled pink bells. We were told that fairies lived inside Foxgloves. I never did see one, but I have all my life kept a very special feeling about the "Flower Fairies" (as you can see from my book-case). More rarely, we’d find orchids, and in dark places hid Lords and Ladies (wild arum), a delight, whose name I could never understand! We found Ragged Robin and Lady’s Smock by the brook; buttercups, celandines, daisies and my favourites, cowslips, in the meadow. In "the copse", just up our lane which consisted of about four oak trees, and a good supply of cow pats. To make mud-pies, all we had to do was scrape up some earth, add some moist cow pat and shape it into a small cake. Just like Mum did with flour and water. Carol insists that I would then eat the result, but I maintain she either enticed me, or looked on in glee at my innocent logic! Carol quite often suffered from a "bilious attack", and now we know why! 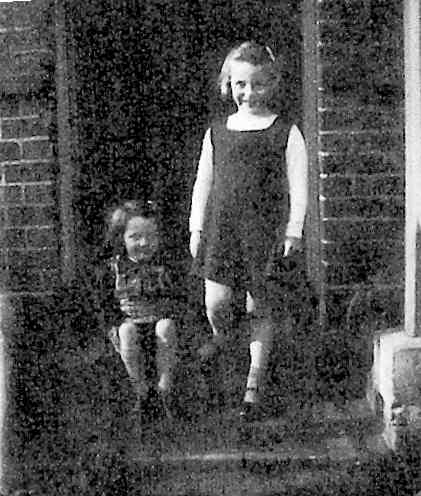 Before I was four-and-three-quarters, and started going to school with Carol, Mum would take me with her on the morning she worked in the kitchen of "the big house" - Newlands – home of the Simonds brewing and banking family. 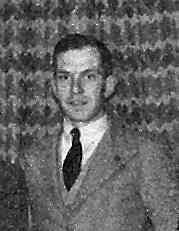 (My Dad had been Groom and Chauffeur there until the Army called him, back in 1939.) One day, Mum swung open the heavy door of the ice-cold larder, and spooned cream, fresh from the dairy into my greedy little mouth. "Here, sshh, open wide." What conspirators we were! There were times when we’d roly-poly down the closely mown banks of lawn surrounding Newlands. Wordsworth got it exactly right: "bliss it was then to be a child". 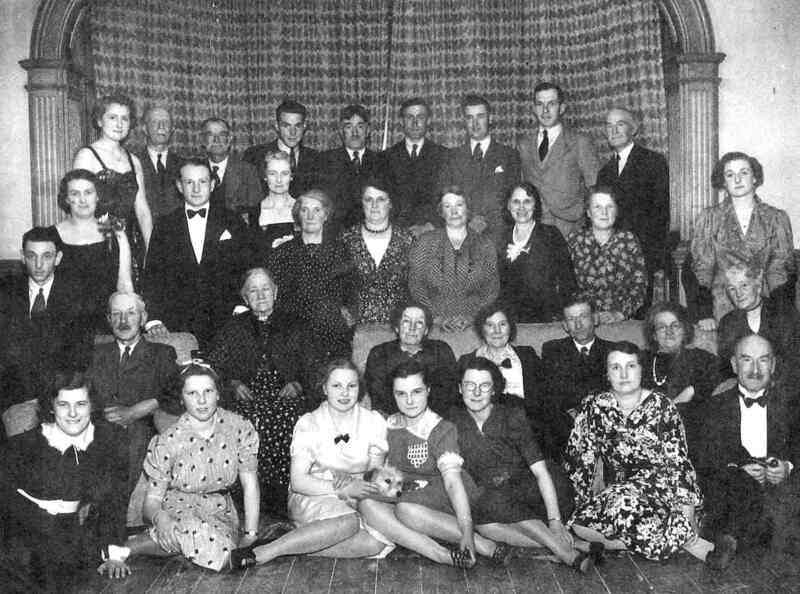 That reminds me, this may have been wartime, but because we were part of the Newlands Estate (the photo of the family and staff shown above was taken in 1939), we had milk, and we had cheese. Not loads of either, but enough as long as we didn't waste anything. "Waste not want not" was a familiar motto. If I didn't want to finish my dinner, Mum would intone, "Eat up - there's a war on", and I'd know I wouldn't be able to leave the table till my dinner was all eaten up. I couldn’t deceive her, either, by hiding hard crusts under the rim of my tea-plate at breakfast and tea-times , but she’d always winkle them out. Argument just wasn’t an option. Mum knew best, and you had to do as she said. And when you’d eaten up you were "a good girl", so it was worth it. We didn't have sweets, or crisps; bananas or chocolate bars, and there wasn't much meat. (Though there was rook-pie and rabbit-stew.) We didn't really know about breakfast cereals, though there were Force cornflakes, with a red-coated cartoon chap on the bright orange packet, and instead of porridge and shredded wheat which both came after the war, there was bread-and-milk, all warm and soggy – even the dark brown crusts - with a sprinkling of sugar sparkling on top. Mum went to the W.I. She acted in their dramas and sang, and attended regular meetings, and won prizes for jam. Some nights as we lay in bed, Carol and I would watch the long beams of the searchlights raking the night sky. Sometimes, we’d hear the wailing of a loud siren over Reading. 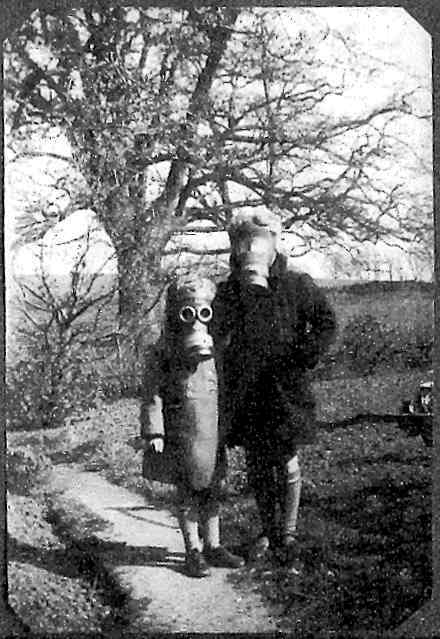 It was either an air-raid warning when the grown-ups would go suddenly quiet, or the "All Clear" which meant they could relax again. (My Mum's sister who stayed with us while she worked in Reading, and her then boyfriend, would visit. Mum's parents came over, too, from Winnersh. We didn't have mains electricity, but Bentley’s Garage on Eversley Road (I remember their son Robin), recharged our accumulators so we could run the wireless. Radio news went over my head, so Carol and I were blissfully unaware of what was happening in the wide world. I made no connection between those long convoys of army lorries and any wider threat. Not until years later did I learn that there was an important military base outside our village of Arborfield, and that Reading had been a target for the enemy, and was hit by German bombers. I’m sure there was a bomb crater somewhere which we had to keep well away from. And I know we kept well away from Bearwood Lake, because someone had drowned there. My sister never lost her horror of lakes. She has never swum in any lake since – not even in New Zealand where she now lives. One day, Mum decided to take us to ‘The Pictures’ in Reading. She didn’t know what was on, but it seemed like a good idea at the time. What we three sat through was Batan – a story of Japanese atrocities. I didn’t understand what was going on, but Mum was horrified by what she’d subjected us to! 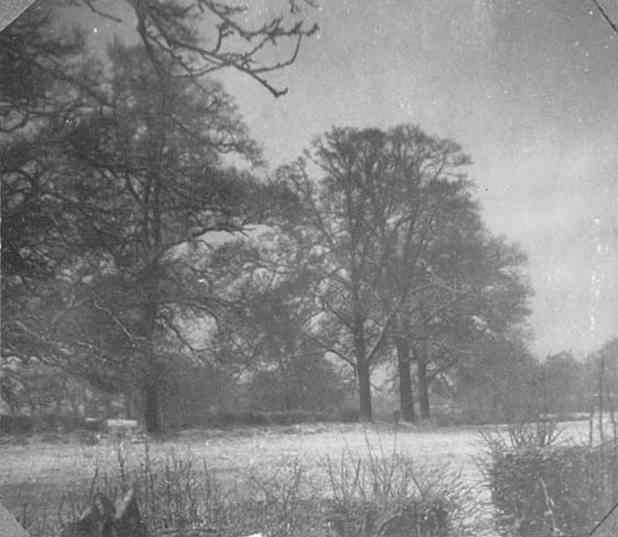 It must have been near the end of the War when the Americans – G.I.s - pitched camp in the field opposite our cottage, on the other side of the lane. What excitement! They revved their engines and drove us village kids around the field in jeeps; they laughed and talked, music blared from their radios, and we were alternately shy and cheeky. I expect there were nylons for the young women; there was certainly chewing gum for all. They offered us food from their campfire, and we dashed home to tell our Mums that these soldiers ate jam doughnuts wrapped in bacon, and sandwiches with jam and bacon and something called "peanut butter". These happy, kindly visitors were like heroes from another world to us, and we loved every minute of their short stay. I can remember some names. Diana Empson and David Hambling from the infants’ school. 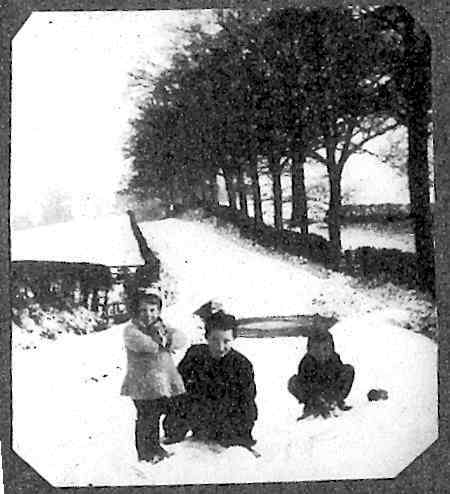 The Corderys who lived next door to the 'Mole' Inn and had two little girls. We never got to play with them. Grant McFee – I don’t know where he lived, but it was near to me. I had a tremendous crush on him. A beautiful blonde little boy. I must have been all of 6 yrs old. Precocious, or what? I never did speak to him. Perhaps he was staying at Newlands. Mum had to fetch 2 buckets of water daily from a pump in the field beyond the bridge. Presumably more on washing day. We had a ‘lav’ at the bottom of the garden – it might have been thatched; indoors I can remember a scullery in the corner of which was a stone boiler. You filled it with water, lit the small fire, and waited for the water to boil (for sheets and whites), and then do the rest of the washing. It would be then put through a mangle and hung out on the line. Monday was always washing day, and a very steamy day it was too, everything scoured and cleaned, floors washed. Tuesday would be ironing day, the iron heated up on the black range (precursor of the Aga and Raeburn, which we had in subsequent homes. Cooking was done on the range, wood was the fuel, and it was polished with blacking regularly. This of course provided our heating, too. 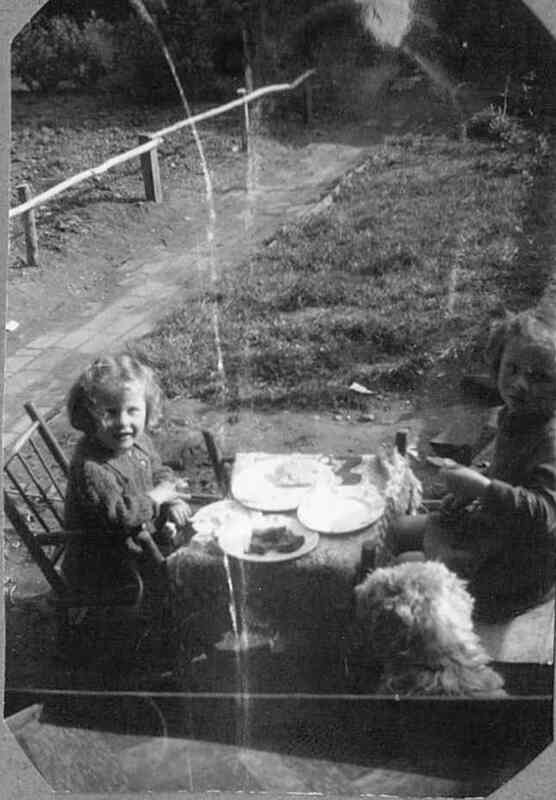 There was a butler sink under the kitchen window, and when we were very small, I expect that is where we had our nightly bath. 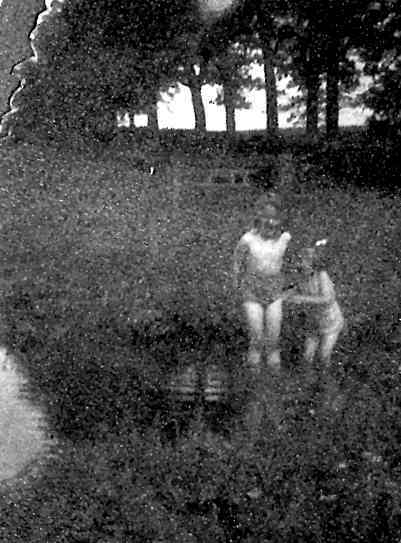 There was also a zinc bath for the weekly bath – children first, Mum last. We can’t have had much water, when you consider Mum had to fetch it! Carol and I were very lucky to have been safely tucked away in the countryside, and to have had enough to eat; not to have heard bombs falling, and buildings burning. And our Dad was one of those who came back. So you can see how, for me, wartime was a time of happy memories. We went to live in Dover once Dad was home. We bathed in a zinc bath in front of the fire, Pam first, then me then Mum followed, when we were dry and hair combed, by a tablespoonful of syrup of figs UGGHH!!. The lamp was a paraffin one with a very fragile mantle and Mum would trim the wick each week to stop it smoking. The shade was white opaque. The thatched out-building was the one-hole lavatory ,wooden with a loose lid , taken care of by Mr. Scott after dark so it was all a bit of a mystery. But he thought it no job for a woman. The Scotts' loo was a mirror version of ours and there were several enormous Victorian paintings hanging on the walls. I must have peeped. Mrs. Scott moved to 'Poplars' after the death of Mr. Scott. Oh, and of course the gypsy encampment along the road to Winnersh, living in proper painted wagons and drawn by horses - they vanished now and again (with the seasons I suppose). Our Headmaster was Mr. Verrall, a kind man who visited me at home when I was ill and brought a large colourful book about baby animals ( which I still have). My Form Teacher was Miss Bosher, who I remember for smacking my hand with a ruler for using my left hand. My class mates were Robert (Bobby) Kinch, Roy Priest, Diana Empson, David Hambling who fell or jumped into the bomb crater and came to school soaking wet, Rosemary and Nony (Anona?) Lamport, who were twins, but not identical. Also, Robin Bentley who lived at the Garage and I adored from afar; he was totally oblivious, I'm sure. A large tin of boiled sweets was found on the road to school and the boys assured us it had been left by a German spy so they pee'd in it. It was an awful waste because it probably fell off the back of an army lorry delivering stores to the soldiers. Lovely little bottles of creamy milk, which was never sour unlike other children's memories of school milk. Knitting scarves for soldiers (lots of dropped stitches but all made with huge concentrated effort); also being given balls of light blue wool to make pixie hoods. Taking lunch to school in a little leather case: tiny sandwiches wrapped in waxed paper and a lemon flavoured tablet to be dropped in a glass of water to produce lemonade. I would love to know if they are still made? If so the taste would take me back nearly seventy years. Playground games.... The Farmer's in his Den; All the boys in our town; Oranges and Lemons; It; What's the time, Mr. Wolf? They must have had officers’ quarters somewhere about [According to the Banns, first published on 11th January 1942, Benjamin Butler Smith lived in Arborfield Parish - probably at Arborfield Hall]. I don’t know where there might have been an RAF base. But he worked in Reading, I believe. He was a Navigator/ Instructor. 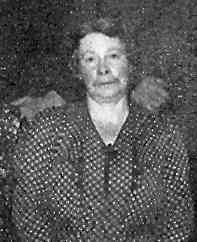 Stella Barbara Smith was born on 31 May 1944, at a Wokingham nursing home, as their first child was stillborn, poor things. Once the war ended they moved back up to Scotland – Dunoon, then many years later – over to Stonehaven, on the East coast. Ben began as a schoolmaster, and ended up as Director of Education up there somewhere - Kincardineshire, I think. 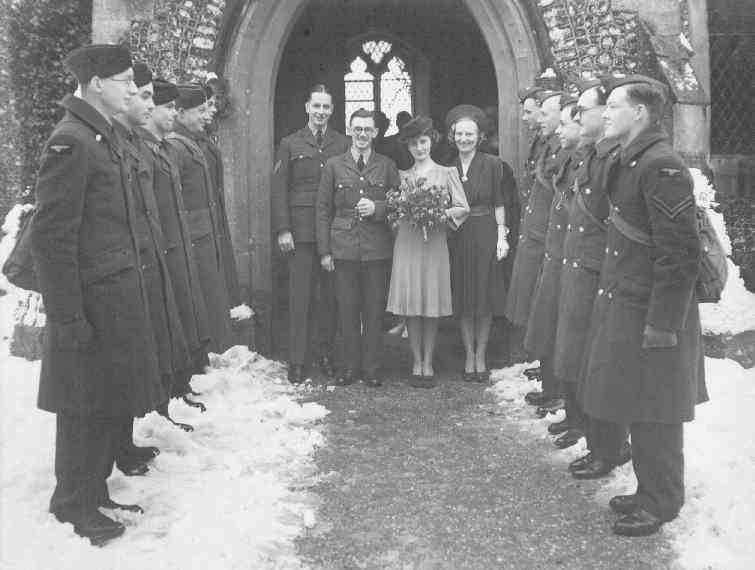 Dad was apparently based in Arborfield as part of 'Operation Starfish' which was all about decoy sites close to major cities to make the Luftwaffe bomb the wrong location using lights and flares and theatrical tricks. The only stories I was told involved his incompetence on the rifle range due to his glasses fogging up inside his gasmask, and being terrified when on guard on the decoy site one night in the dark by someone coughing close behind him - it transpires that sheep sound very human when they cough. He also told us about cycling through a transparent man at a crossroads one night on the way home from the pub. Other than that it appears he had a relatively easy war life and spent the majority of his evenings playing the piano in the bar of the Bull pub in Arborfield. I also found note that one of his pals recalled him as being a 'nifty forward in the Arborfield 11' so it appears that football also had a place in the Smith war effort. The dates I can find in his scribbles indicate he was posted there from March 41 through to Dec 42.